I live in California. Let me start with that. So when my new BFF at Eddie Bauer reached out to me to ask me to review a down jacket, I balked. I usually get by with wearing various sweaters and fleece jackets except for the couple days we spend in Lake Tahoe every Thanksgiving and the week we spend out East with my sister and her family when Christmas rolls around. But my new friend convinced me that the Yukon Classic Down Jacket, while being rated for temps all the way down to 0F, wasn't too warm for more chilly California nights. I bit and ordered it in red. Back in college I bought myself a bright pink very puffy down jacket. I loved everything about that jacket except for the fact that my school friends promptly nicknamed me The Raspberry. When I put it on I felt cozy, warm, and just plain comforted. My Eddie Bauer Yukon Classic Down Jacket brought back that exact same feeling... without the unpleasant nickname. The fleece lined collar and cuffs are extra soft and the down is warm without being unflatteringly puffy. It's the middle of October and I've already worn my jacket twice. And no, I haven't been out East or up to Tahoe. It's a light enough jacket to work for the cooler CA temps, but I'll also definitely be packing it when we head to the snow. Like all of my other Eddie Bauer duds (pretty much my entire closet...) I love that it's classy, fashionable, but utterly comfortable and functional. Plus, you know, should I ever be caught out in almost sub-zero degree weather, I'll be warm and toasty. Though I better not, I do live in California for a reason after all, namely because I enjoy not being cold. The Yukon Classic retails for $129-139, but right now Eddie Bauer is having their 70th Annual Down Sale and the jacket is $40 off until 11/7. It's an unbeatable deal for a jacket you'll have for years. Just so you know, I was sent a jacket for review purposes, but I was not compensated in any other way to write this post. All opinions expressed here are mine and mine alone. 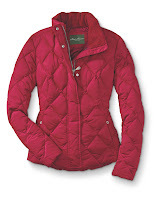 I adore Eddie Bauer and will happily model for you whatever I'm wearing when we meet. 99% guaranteed it'll be from there. Did you like this The Lemonade Stand post? Don't miss the next one! Subscribe via my RSS feed. Disney on Ice opened at HP Pavilion tonight, but it's not too late to get tickets for tomorrow or this weekend! (Not in the Bay Area? Get the full Disney on Ice show details and tour listings here. Use code: MAGIC at http://www.ticketmaster.com/promo/ajyhf0 to get the discount. There are two shows tomorrow (Matinee and evening) and three shows each day this weekend. So grab those princess dresses and come on! We've been to two Disney on Ice shows and I've been beyond impressed by how much fun they really are. Even my daughter who swears she'll never go to Disney Land because she's scared of Mickey, adores going to these presentations. Frankly, I always have fun too! Plus, there's truly something special about seeing a sea of little girls in their princess finery! There's not much I enjoy more than giving unsolicited advice, unless it's giving solicited advice. Want to know how to handle a tricky coworker? Need to buy the perfect baby gift? This is the place to be. Welcome to my lemonade stand! Email me your questions, I'll do my best to help! kikadesaATyahoo.com. Want to know more? Click here to get to know me better. Are you looking to advertise or work with me? Check out my PR Friendly Press Kit. It lists everything you need to know.